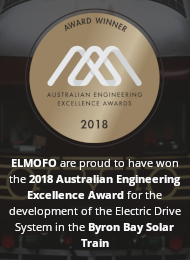 In many situations it is not feasible to mount a solar power system on a remote house or building due to the aspect, roof space, structural integrity or temporary nature of some buildings. 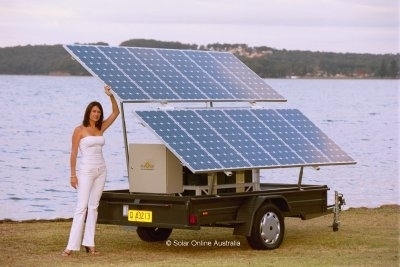 For these situations our Trailer Mounted Solar Power Systems offer an ideal solution. 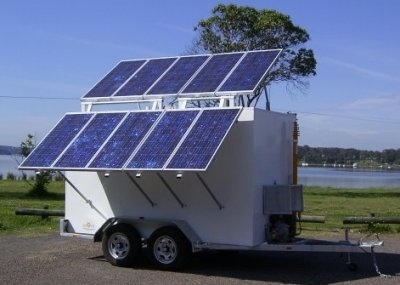 These solar trailers are a fully transportable solar power system designed to supply relatively small remote houses, radio repeater equipment and other remote loads. 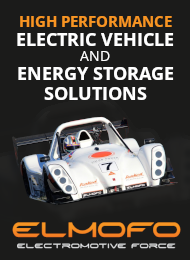 Priced similar to an installed system of the same capacity, these mobile trailer systems feature 240VAC pure sinewave power output and more than 4 days of battery backup capacity. 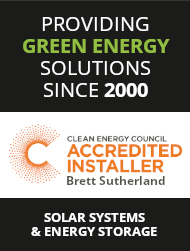 The tilt angle of the solar array is adjustable to allow optimum power production through all seasons. It also folds down for ease of transport and storage. The systems feature a Plasmatronics PL series regulator with full system monitoring. Earth leakage protection is incorporated on the AC output for user safety. 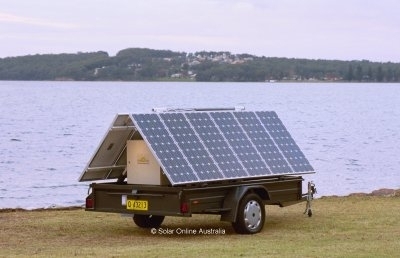 Please contact us if you require more information about our solar trailers.